I wasn't expecting great things from the Hobo stove, having been disappointed with the the pot stand, however, with some hot coals left over from boiling the kettle and a ready supply of short, thick twigs, it's surprisingly effective. Coupled with a relatively thin steel 12" frying pan, I had tea and breakfast for 4 made in about 20 mins. Cant praise Kelly Kettle products and service enough you're doing a grand job. I have a very old, battered and much loved aluminium Kelly. I have had it for well over a decade. A lot of my work is outdoors, away from facilities or shelter. I use my Kelly a lot to boil water to make a brew, and sometimes use the base as a mini fire pit to generate a bit of warmth at lunchtime on a cold and miserable day. In the past, I have cooked on the fire base, using a home-made pot stand. Having recently bought a hobo stove attachment, I am thrilled! It is much more stable and efficient than my home made effort, it also packs so neatly inside the base. I can know fry an egg for my lunch as well as have a hot brew. I recieved this with my mugs last week and only got around to using it today. I was on the bog collecting the last of my dried turf for the winter fire. Coffee was made then lined up the hobo stove to cook my dinner a chicken, prawn and chorizo Paella. Measurements were made with the mugs and all the cooking done on the hobo stove with a turf fire burning. Absolutely brilliant !! Paella cooked to perfection. It will now be used extensively in future, along with the rest of the Kelly Kettle products. Hobo - the Kelly Kitchen :-)Review by Pat French, U.K.
My second outing with the new Hobo stove prototype went every bit as well as the first but this time I had my camera. That little green bag now contains everything I need to cook properly in camp. It's like a Russian doll. Inside my old and much loved aluminium Base Camp kettle, are the two new nesting mugs both of which can be used as pans in an emergency. Inside the fire base is the Hobo stove, the cookset and gripper. This still leaves loads of space for flint, tinder and a spork etc. I also have a favourite pan that's been with me for years and that fits too. The wind was howling at gale force down the Rheaedr Valley (Wales) at the Pistyll Rheaedr waterfall where I spent a long weekend. At mealtimes I adopted a system. First I would boil water for a drink. The rest of the water stayed in the kettle for washing up. This ensured I had plenty of coals and a good fire going. Then I got out the Hobo stove. Throughout the weekend the Hobo cooked porridge, bacon, scrambled eggs, rice, spuds, a curry and kippers. Who needs dehydrated food now? All this in a wind gusting to thirty miles an hour. I even cooked in the 500ml mug to save washing up while in chef mode! 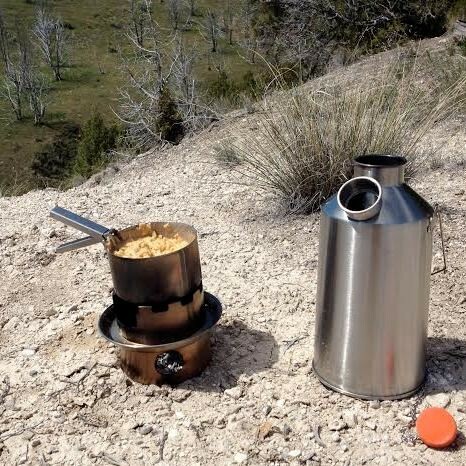 The addition of the the Hobo stove and the mugs gives you absolutely everything you need in the field. Sorry if I seem to be gushing a bit but I am seriously impressed by what you get for just a few extra grams in weight and no extra space taken at all. And don't forget that you've lost the weight of your old mug and the old stove that you don't need any more! All with free fuel every time. Well done Kelly Kettle, a great move. I spent the weekend camping and had my stainless steel base camp Kettle Kettle and cooking kit with my new Hobo stove with me. 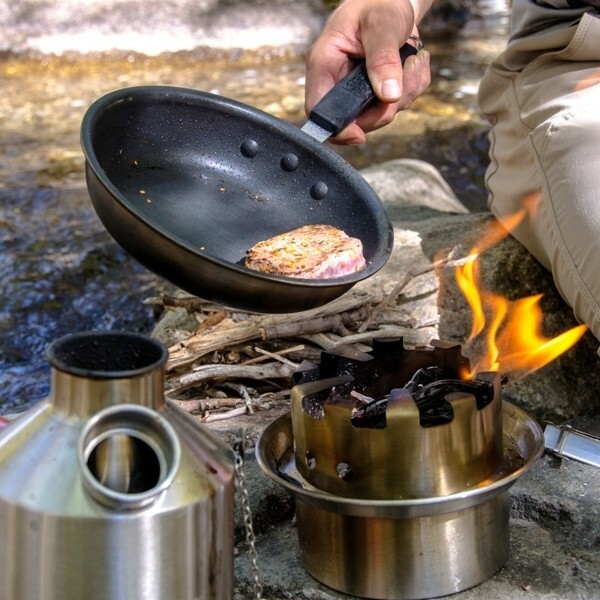 The Kelly Kettle is excellent boiling water fast and with the pot stand on top it can heat food at the same time. I have had my set about a year and it is used a lot and I would not be without it. 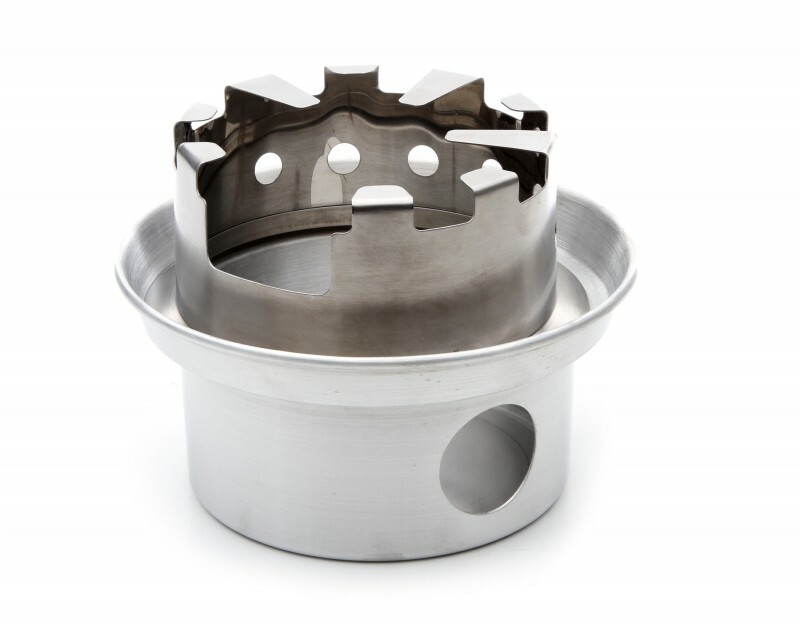 The new Hobo stove completes and improves the set. I used the hobo stove for the first time and found it very easy to use and control the heat cooking chicken curry to perfection. In the mornings a full fry up was done with very little fuel and no hassle. A perfect additon to the already perfect kitReview by Matt P.
Fitting neatly inside the base along with the cooking set & a tobacco tin of tinder/firesteel. Took it out on my first camping trip of the year, and it was superb. Come breakfast time, I boiled up plenty of water for some tea and coffee whilst heating up some tinned tomatoes in my saucepan using the pan stand, to get the most efficient use of fuel. Then just swapped the kettle for the hobo stove when it boiled, bunged in some more fuel and then cooked a huge fry up on top. Perfect! (pics on twitter). This has become my first choice stove/kettle over my gas, trangia and petrol stoves (I have a lot) and collecting suitable wood/fuel etc to store/dry. Is a great way to keep you active if you are bored around camp, if you are more of a 'basecamp' style camper such as myself. P.S. Would love to see removable lids for the new mugs to keep your tea warm whilst cooking on top of the stove. 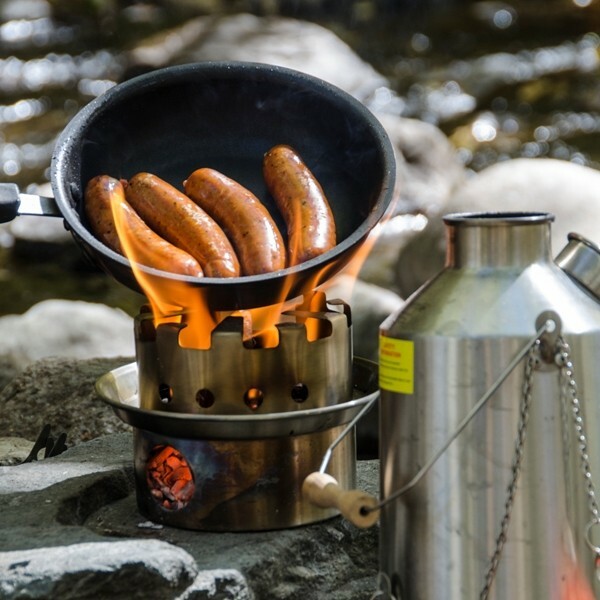 The hobo stove makes the Kelly Kettle much more versatile. It is a great addition. Review by Robert Laumann, Idaho, U.S.A. I picked up my hobo stove this morning, and since my wife and daughter are at work and school, I promptly gave the stove a try, after a short hike from my house. The stove appears to be sturdy, like the kettle. It fits very well into the kettle. I first heated water to cook some freeze dried backpacking food, while at the same time heating some excellent hibiscus tea. 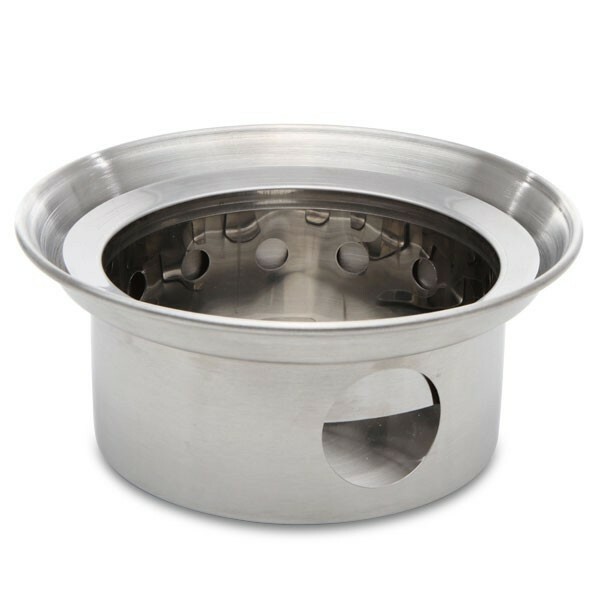 With the water hot, I used the hobo stove to cook my meal. I found that it had very good air flow for burning wood, and retained heat for cooking very well. It was easy to maintain the proper heat to cook within the necessary temperature range for as long as necessary - about 20 minutes in this case. My initial impression is that, as I expected, the hobo stove makes the Kelly Kettle much more versatile. It is a great addition. I will send some pictures in a separate email. As you might notice, the one item I am missing is a Kelly Kettle cup. I apologize for the omission. I will soon fix that problem, and buy the cups.